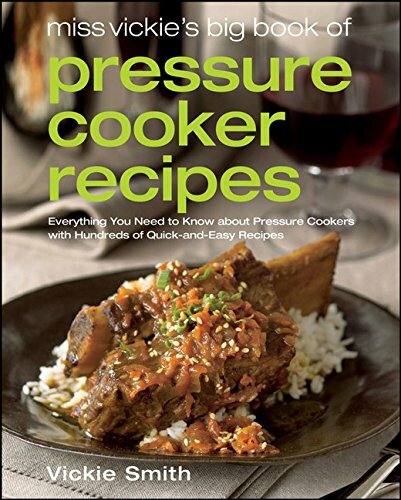 Looking for the best pressure cooker cookbook? 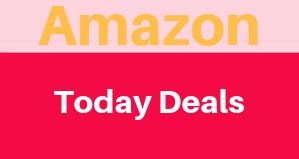 Here you will find the best books from the Amazon Best Sellers to the best rated books that not only come with the most detailed recipes (and lots of them) but also the best tips to use your Pressure Cooker so even if you are just starting with cooking under pressure you are going to be cooking like a pro in no time! Having a pressure cooker is a great addition to your kitchen with the great advantage that you can cook your meals quickly. Making it perfect for people that don’t have too much time to cook, or does folks that like to choose on the spot what they want to eat instead of having to think hours before on what their next meal is going to be. On the other hand, even though pressure cooking is more popular each year getting started is not that easy as you may wish. It can take a lot of time to understand all the features and techniques that work best, along with what recipes to use and even what types of food you can cook. And another hard reality is that a lot of pressure cookers don’t come with a very good manual to help you get started. Making that a lot of people are not getting the best out of their devices and may even be disappointed in their results. That’s where cookbooks come in. If you find a good one, you’ll get lots of amazing recipes to try as well as information about how to make the most of your pressure cooker. Even when you are a more experience cooker with pressure, the information is still pretty useful and is going to help you improved your cooking skills. In our list, we research for a great selection of pressure cooker cookbooks that will be an amazing partner for anyone who plans to use a pressure cooker or who already uses one. Many of these cookbooks offer a wide variety of recipes but we’ve also tried to include some that are well-suited for particular uses. 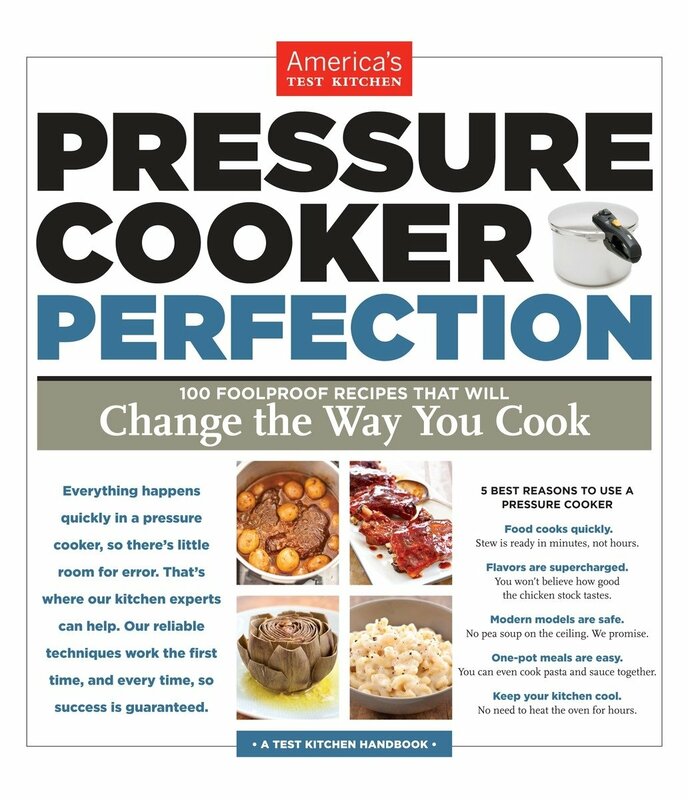 This book is written in 2012 by Bob Warden, it was 2012 National Bestseller cookbook, and is still the bestseller pressure cooker recipe book on Amazon. The author of the book is a famous man in the pressure cooker world. He is a successful TV cooking show host, product developer, and QVC manufacturers’ representative. He wrote this book with the intention of redefining the way that pressure cooking is done. This book comes with plenty of useful tips, delicious recipes, and nutritional information. And it cost less than $13 so is a pretty great choice and you will find a lot of tricks and amazing uses for your pressure cooker. 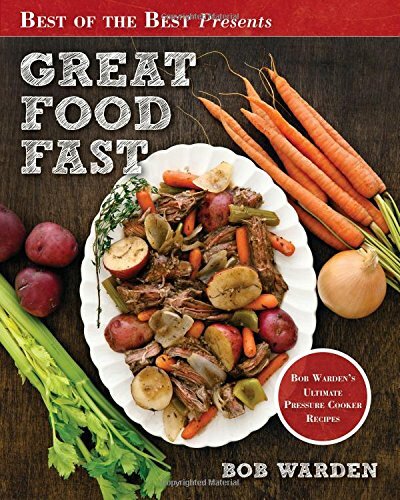 Although Great Food Fast by Bob Warden, does indeed have a lot of useful tips, great recipes, and nutritional information, and it is straying from the traditional format, it doesn’t come with a Table of Contents so you can browse around the book. 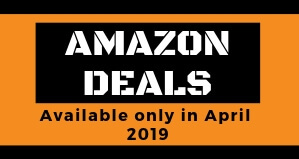 With more than 2000 reviews on Amazon and for just $7.19, this cookbooks is a great addition for any beginner looking to start with his beautiful Instant Pot. There’s nothing the Instant Pot can’t do―and with the right cookbook in hand, there’s nothing you can’t cook. 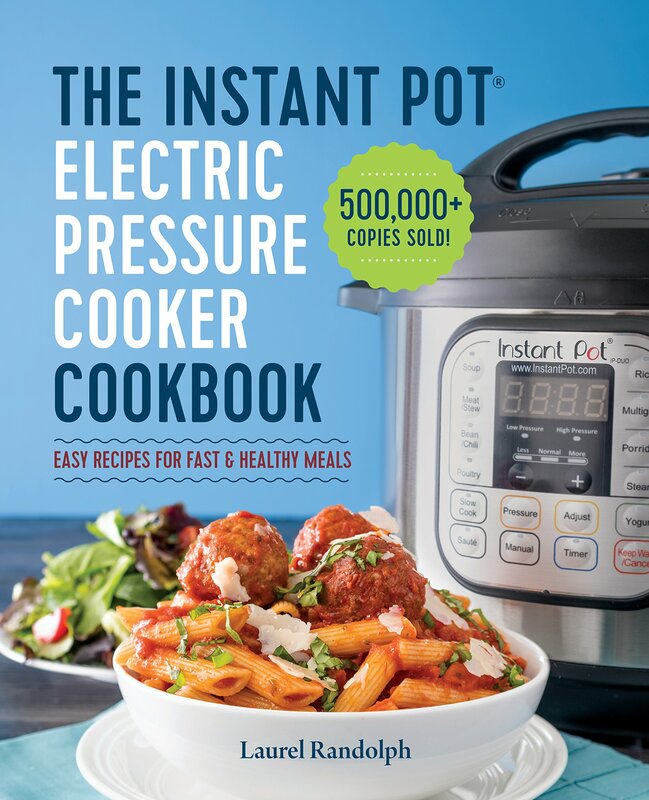 The Instant Pot Electric Pressure Cooker Cookbook will give you all the tools to start with a variety of healthy and easy-to-make recipes that are going to give you the confidence to start with your pressure cooker meals. From delicious breakfasts and the tastiest stews to dainty desserts and more, this Instant Pot cookbook is on point to satisfy everyone at the table. This book is a great partner in any kitchen from beginners to long-time enthusiasts, this Instant Pot cookbook is your A-Z guide for all things Instant Pot. This book is recommended by Instant Pot and comes with a lot of amazing photographs and more than 75 easy to made and well-tested recipes, this indispensable book is the ultimate collection for tasty weekday meals. The author of the book is Coco Morante a well-known recipe developer and food blogger that is in charge of the popular Instant Pot Recipes Facebook page and it’s also the author of the blog LeftySpoon.com. Her recipes are featured in a lot of publication both print and online such as Simply Recipes, The Kitchen, and Edible Silicon Valley. As we mentioned before finding first steps to use your Instant pot as well delicious, tested, and easy to make recipes that are both inspiring and trustworthy is not that easy, until now. 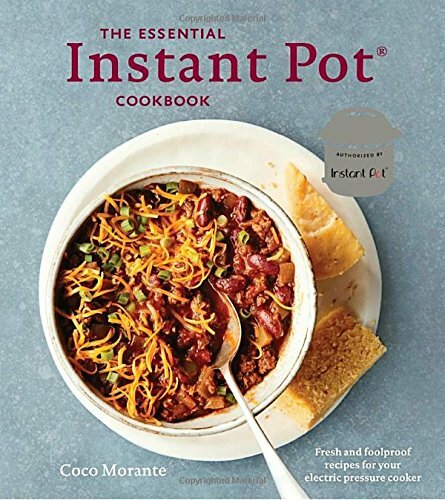 The Essential Instant Pot Cookbook covers each meal of the day, giving you a great number of tested classic recipes, like spicy beef and bean chili, a whole roasted chicken with mushroom sauce, and decadent New York cheesecake, as well a number of contemporary meals, such as Greek-style Gigantes beans with fresh feta, braised pork loin with balsamic vinegar and caramelized onions, buttery cauliflower mashed potatoes, pork adobo, just to name a few!. Whether you’re looking to expand your pressure cooker recipe repertoire or seeking the ultimate gift for the Instant Pot aficionado, this is the book to have. Renowned for controversial responses, this books is from the people of America’s Test Kitchen and it’s another cheap option to get your pressure cooking on! (just over $13). With a wide range of amazing recipes that will put a great use to your pressure cooker’s full potential. This cookbook comes from America’s Test Kitchen, which makes it a little bit different than the other books on our list. The book comes with a big focus on more traditional recipes, and more too the ones that include a lot of meat and potatoes. For this reason, the book is not a good choice when it comes to versatility with your pressure cooker, but it is still a really good cookbook, especially since the recipes are relatively simple and don’t include hard to find ingredients. The book focuses on that cooking under pressure results in better-tasting dishes because every drop of flavor is trapped in the sealed pot. This fact, combined with the shorter cooking time, means that your dishes will be supercharged with flavor. So if you were looking for an old-school book for those home cook style recipes this is the one to help you get to the next level and look like the ultimate chef. The biggest difference with this book is that you will get recipes for both electric and stovetop pressure cookers. In addition to having almost 400 different recipes, the book comes with great information about pressure cooking itself, such as safety information, common mistakes, tips, and tricks, and it also comes with step-by-step instructions on how to use the pressure cooker. So is one hell of a book when it comes to first time users. Another cool factor for us that comes with the Miss Vickie’s Big Book of Pressure Cooker Recipes is that you can understand and read through the whole book in an easy way since it has an index that spans 11 pages that will have you trying new and familiar recipes that you love time after time – and for just a little more than $15! This recipe book has everything you could possibly need. You’ll learn how to cook delicious meat feasts, as well as controversial recipes that you may not have come across before. Vickie has done an outstanding job of catering for every consumer, and even businesses. With close to 400 recipes that are delicious and tested all easy to understand and with answers to all of your pressure-cooker questions, Miss Vickie has created the single most useful pressure-cooker book ever published. It’s a resource you’ll turn to again and again as you explore the world of pressure-cooker possibilities and pleasures. Cooking Under Pressure is a pretty famous recipe book for pressure cookers and this is a new edition of this creative cookbook that takes into account the features and functions of the best pressure cookers models. The book comes with more than 150 different recipes, including both dinners and desserts, so there is a lot of variety to get you cooking abilities going. 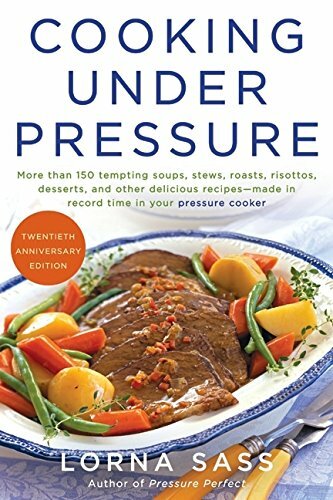 Cooking Under Pressure is available for just under $14 and is the ideal partner for those giving their first steps into the pressure cooker world while having a range of simple to more challenging recipes allowing you to improve your cooking skills and gradually feel more comfortable with your pressure cooker. The book starts with a lot of tips and tricks to make your pressure cooker tick, and at the end of the book, you will get the all the troubleshooting solutions. Cooking Under Pressure is a great book for those that found themselves lost with their pressure cookers, this cookbook is going to give you a confidence boost to put you in the right track allowing you to get to grips with your new pressure cooker with little to no effort at all. This amazing book is written by Lorna J Sass a true advocate to the pressure cooker movement, her first edition from Cooking Under Pressure was released in 1989 when people were still afraid of it. She is also a widely known as an award-winning cookbook author. When published, this cookbook became a best-seller with over 250,000 copies in print. The new and revised edition came into the market in November 2009. Cooking Under Pressure is a great companion for both beginner and experienced pressure cooker user. This book has a wide range of simple to high-level recipes helping you to improve your cooking skills. This book will help you to feel more comfortable and enjoy your pressure cooker.